Debugging is a most common and most often used word in the world of programming and Excel VBA is no exception. Debugging is a process of idenfying errors in a program so as to rectify it for proper execution of the program. "Debugging" came from the word "bug" which usually indicates flaws or defects and the term "Debug" signifies, removal of bugs. 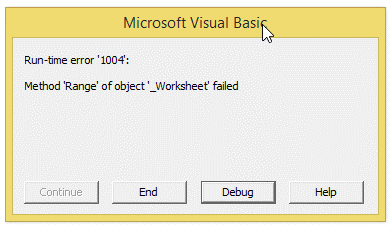 The VBA code is debugged from Top to Bottom and is sort of, Control flow analysis. The debugging is used to spot out the error. In large programs, it�s the Degugging, that saves us from identifying the flaws with less effort. Please note that there is an error in the below mentioned code which when run returns an error, which when not handled properly will result in crashing of this workbook.So this code is not meant to run for an amateur programmer. 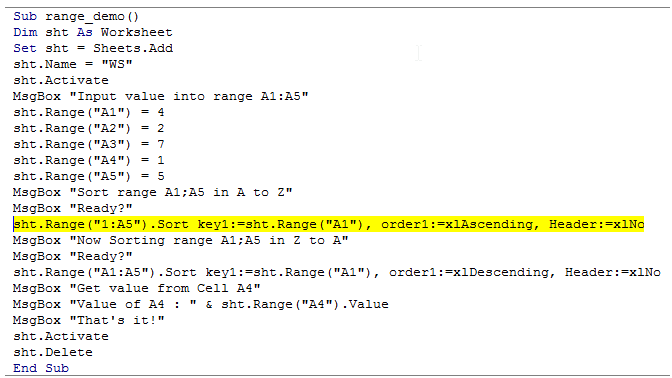 MsgBox "Input value into range A1:A5"
MsgBox "Sort range A1;A5 in A to Z"
MsgBox "Now Sorting range A1;A5 in Z to A"
MsgBox "Get value from Cell A4"
1) I frequently use a Macro - is there a way to quickly access the Macro in the Excel Ribbon? 2) How can I execute an event at a predetermined time from my Macro? 3) I want to automatically run a procedure whenever I close my WorkBook so that it is in a known state - how can I achieve that? 4) How can I make my macro wait for 5 secs before executing the next command? 5) How can I identify the cells that influence a particular cell to help with debugging of my spreadSheet or understand a spreadSheet that I inherited? 6) I have a macro that takes a lot of time for execution - how can I keep the user informed that the macro is running? 7) How can I clear cell after activating a routine when there is a change in value of a cell? 8) How do I assign a macro to a shape using VBA? 9) I frequently use a Macro - is there a way to quickly access the Macro using a Keyboard Shortcut?